In a blender, add garlic and blender for 30 seconds. Next add yogurt, avocado, dill, cucumber, lemon juice, and salt & pepper. Blend until creamy and completely combined. Place kabobs on grill and grill 4-5 minutes per side. Remove from grill and let rest for 2-3 minutes. 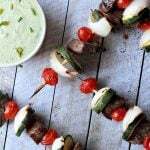 Serve Beef Kabobs with Avocado Cucumber Tzatziki Sauce.